Honeywell’s Boeing 757 test bed is short on passenger amenities, but long on capability. How can airborne connectivity impact the passenger experience? Honeywell (Chalet 104) has set out to answer this question with its Boeing 757 connected aircraft test platform. Currently on its worldwide "Power of Connected Tour," the hard-working, stripped-down airliner (the fifth 757 ever built) is outfitted with technology that can enhance the roles of pilots, operators and passengers. AIN was able to learn more about the passenger experience on the connected aircraft when the Honeywell tour stopped at New York’s LaGuardia Airport on June 9. According to Honeywell, the passenger experience is improved by upgraded airborne connectivity speeds that are up to 100 times faster than other airborne technologies. Airline customers also enjoy high-speed connections with fewer dropped links, as well as smoother and safer flights, made possible by Honeywell's GoDirect products (see story on this page). The most key driver of the connected aircraft is Honeywell's GX Aviation technology for airline passengers and JetConnex for business aviation users. Powered by Honeywell’s JetWave satellite communications hardware, GX Aviation and JetConnex bring high-speed airborne connectivity to commercial and business aircraft, via Inmarsat's Global Xpress Ka-band satellite network, which began service in 2016. Along with GX Aviation and JetConnex, Honeywell also offers a satcom network app that allows administrators to control permissions and restrict data streaming on devices; and it even can be used to block devices from the Wi-Fi system if a passenger consumes too much expensive data. On board the 757 connected aircraft on a “flight to nowhere” from LaGuardia, AIN was able to test the connectivity by streaming audio and video, video conferencing, texting and accessing social media and email accounts during the one-hour demo hop. Ultimately, there were 33 devices connected at one time without any major issues. Ka-band streaming rates are on the order of up to 32 megabits per second (Mbps), although rates are lower for business aircraft—up to 15 Mbps—due to antenna size limitations. Erica Brinker, Honeywell senior director, connected aircraft, told AIN that the looming possibility of a U.S. laptop ban for flights coming in from Europe could potentially be a hurdle for any company offering high-speed airborne connectivity, as passengers wouldn't be able to carry on larger devices on airliners. 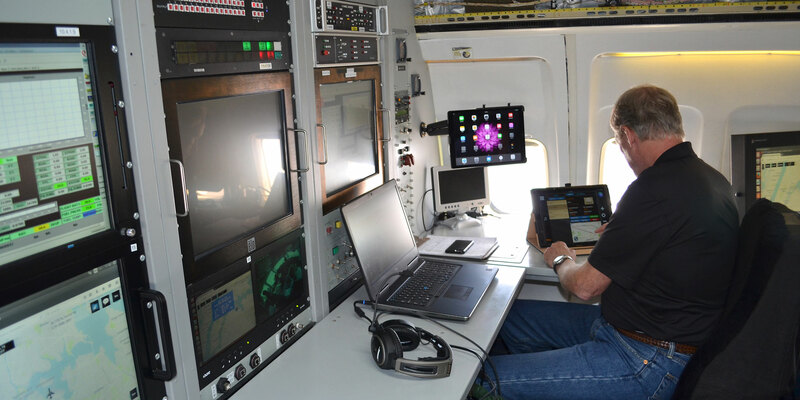 However, smaller mobile devices can easily tap into GX Aviation connectivity so passengers could complete work that they would normally reserve for their laptop on their phones or tablets. In addition, airlines control bandwidth restrictions and offer various connectivity packages, meaning that, in theory, they could incentivize passengers to carry smaller devices by increasing bandwidth for those traveling with tablets or phones. The 757 connected aircraft has visited San Francisco, Dallas, LaGuardia and London, but the first leg of the Power of Connected Tour ends here at the Paris Air Show. The aircraft will be on display from June 17 to 20. The second leg of the tour starts in July and will include stops in Dubai, Beijing, Tokyo and a few more cities over the rest of the year.